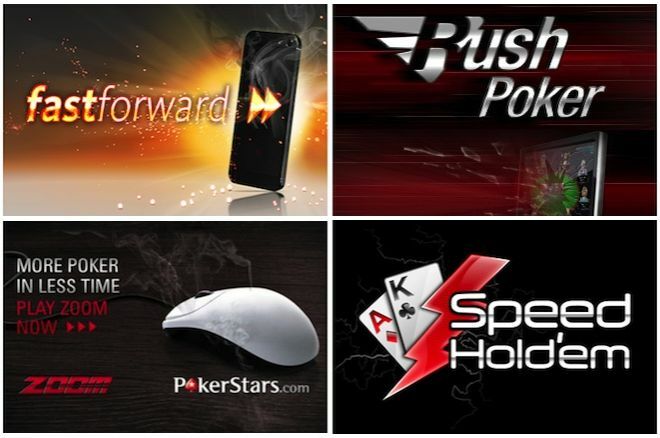 “Fast-fold” poker — e.g., PokerStars’ Zoom, Full Tilt’s Rush Poker, iPoker’s Speed Hold’em, partypoker’s FastForward Poker — continues to be one of the most popular ways to play cash games in the online poker world, thanks both to its frantic pace and the fact you’re often playing for larger pots than in a standard cash game. For those of you who have been living under a rock for the past couple of years, or perhaps those of you who are new to this crazy game called poker, let me explain what fast-fold poker actually is. Fast-fold poker plays almost exactly the same as a standard cash game, but instead of being seated at the same table and against the same opponents for the duration of your session, you are part of a pool of players. Unless you are in the big blind, you can fold out of turn whenever you like and are instantly whisked away to a new table with fresh opponents. Don’t like the you’ve been dealt on the button? Click the fast-fold button and receive new cards and opponents in a flash. When playing online at a regular table of six-handed no-limit hold’em, you may see as many as 80 hands per hour, depending how quickly everyone is playing. But at a similar fast-fold table, you can often see 300 or more hands per hour! Because of this huge difference, my first tip for attempting to beat low stakes fast-fold poker games is to play fewer tables than you normally would. They say that each fast-fold table is like playing four standard tables, so bear that in mind before you go fire up four tables, because doing so will be like playing 16 standard cash games! The first thing that you’ll notice in fast-fold games is that play is generally tighter than in a typical cash game. Since players don’t have to wait as long for premium hands, they will often instantly discard their trash and marginal holdings preflop. That’s not to say there aren’t any maniacs out there, because there are plenty of recreational players who are attracted to fast-fold poker and are looking for a quick poker fix. These tighter ranges often become more apparent in three-bet pots where a large percentage of players will toss away their marginal hands and only continue with the strongest part of their ranges. This tendency leads to your opponents playing a more “fit-or-fold” style postflop. This means you can take more stabs at the pot on the flop with a continuation bet, yet you should be less inclined to fire bets on the turn and river without holding the goods. The majority of players are eager to fold their marginal or weaker hands on the flop. Why would they want to spend time analyzing a marginal spot to call when they can fold, start new hand right away, and promptly replace that tough decision with a much clearer one? Due to this fit-or-fold nature, you can often continuation bet or steal blinds from the button with smaller bet sizes, as your fold equity is larger than a standard speed cash game. These are a few of the differences between fast-fold and regular games that affect strategy. However, there are still plenty of aspects of fast-fold poker that remain the same as a standard cash game. While it is easy to forget that fact, I suggest you commit it to memory. Position is still king and always will be. Much as in a normal cash game, you should be playing tight from early position and loosen up the closer to the button you get. You should also be taking as many notes as you can on your opponents, because reads are difficult to make in this format. Knowing if a player is a habitual defender of his big blind or will let you steal it with a min-raise from the button is a great piece of information to have available to you. What strategies have you employed successfully in fast-fold poker cash games? Let us know in the comments box below.